Straight fly leg of the loop = good. Non straight fly leg of the loop - Domed or convex = not good, unless its deliberate. Dipping wave in the fly leg or concave = not good, unless deliberate. Non straight fly leg is the generalised term and it can cover a multitude of ills. I still find myself using the older organization name. I don't know where the "tendancy" idea originated, but I think it is a worthwhile observation to point out to an intermediate caster that throws good loops at 30 feet, but then starts to get a slight wave in the top leg at 40 feet. If nothing else it makes the student aware of any slight dips in the fly leg that start to show up when he tries to cast longer distances, and indicates he needs to make changes in his stroke to eliminate them. In my experience the earlier a students is made aware of the problem the easier is it for them to fix it. I think Al Kyte made good use of the idea in his book on A Guide to Better Fly Casting. You start your forward cast when your back-cast line has almost straightened behind you. If you hear a whip-cracking sound as you cast forward, you starred forward too early-while the line was still moving rapidly backward. If you feel a rug after your back cast, you have waited too long; your line has straightened and is starting to drop. If you wait this long when using a heavily weighted fly, it will swing up and down when being pulled forward and may hit and even hook you. Your fly line will not always straighten behind you, especially if there is a wind, So your initial forward movement may have to help pull the line straight, as well as start it moving. Any unevenness in this initial pull on the line, as from punching or shocking the rod, will cause the line to move away from its straight path. So instructors use words such as gradually and smoothly to describe the initial movement forward. Some anglers, when losing the feel of the back-cast fly line, start moving or creeping the rod tip forward before applying force to make the forward cast. This attempt to regain the feel of the line wastes some of the movement needed to make the forward cast. With too little of the rod's movement still available for the cast itself, people tend to jerk the rod forward rather than move smoothly. Check to make sure you are holding your rod absolutely still between your back cast and the start of your forward cast. Weak wrist muscles are better suited for quick, final movements than for those requiring sustained, evenly applied force. 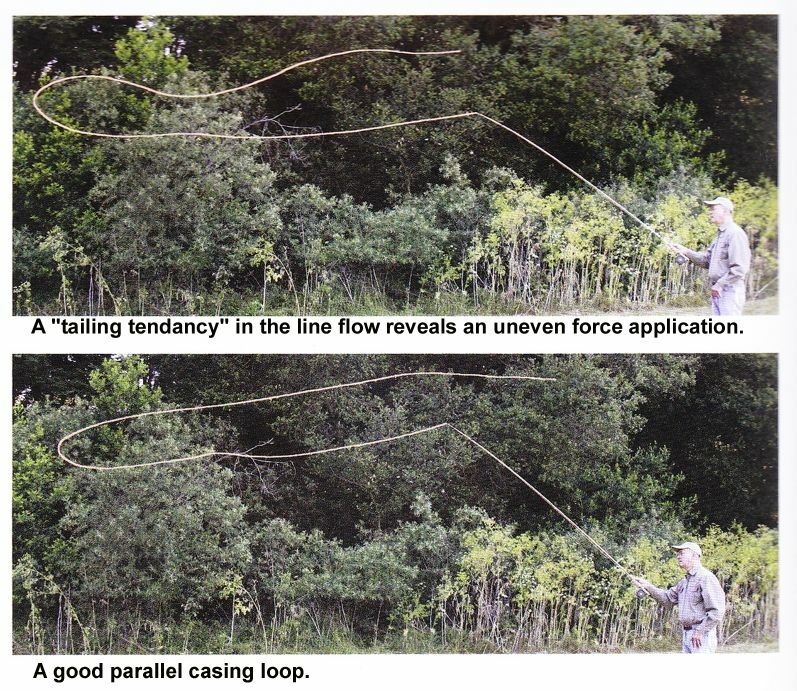 A tailing loop occurs in an overhead cast when the rod tip or any of the line coming behind it dips below the path of the moving fly line. When I certify· a casting instructor's performance, I do not want to see a tailing tendency in the basic overhead cast. His idea of starting a cast with a wrist rotation as being a common cause of tailing loops is an observation that I had not seen before, and is something I will will pay attention to in the future. Morsie wrote: Straight fly leg of the loop = good. Non straight fly leg of the loop - Domed or convex = not good, unless its deliberate. Al Kyte describes his loop in the second picture to be a good parallel loop. According to your definition it should have a straight fly-leg though. Following the dictionary about straight, Al's loop isn't straight (and it also isn't parallel). For those (and other) reasons I have said: "There is no straight in fly casting." Are we fly casting instructors having our own (different) defintion of what straight is? Or might we better use terms like proper tensioned? Sorry, if you think I am driving it too far here. Just looking for precise terms all of the time! I certainly agree with you that there are no straight lines in casting, but If it is precision that you are after then I don't think "proper tensioned" is precise (or accurate) either. Since line tension at the loop has to do with its linear mass density and its tangential velocity going around the loop I would expect the line tension profile in the two photos taken from Al's book would be nearly the same assuming they had the same propagation velocity. You can get a sense of that by observing that the bend in the rod due to the tension in the rod leg appears to be the same in both photos. I think the top leg of most tournament casters accuracy casts are slightly domed so they get a reliable turn over of the fly, but I am sure you can find examples of great casters where that is not always the case either. Maybe we should accept the fact that just as there are no straight lines in fly casting there are no absolutes either.